Start your Switzerland Holiday Package with arrival at Geneva where you will receive a warm welcome and then get transferred to the pre-booked hotel. Situated at the banks of Lake Geneva at the foot of Alps, it is amongst the most beautiful cities in Europe. It is the priciest cosmopolitan of the continent and second largest city of the country. It has rich cultural heritage, delectable cuisines, world-class entertainment, top-rated accommodation options and unlimited recreational opportunities that attract visitors from every corner of the world. Upon arrival, check-into the pre-booked hotel and enjoy rest of the day at leisure activities with dinner and overnight stay at the hotel. After enjoying breakfast, depart on Geneva City tour with a boat cruise. The city is renowned for its appealing landscape, the sophistication of its citizens and amazing attractions. With the knowledgeable guide on hand, you will see some of the amazing attractions of the city which includes the Old Town, Geneva Water Fountain and the wonderful Flower Clock. Continue your journey on the magnificently beautiful Geneva Lake which is often referred as the most spectacular lakes in Europe. It let you discover the major attractions of the city like Stone of Niton, the Black Harbour, the Diodato House, the UN Building, and the Castle of Bellerive along with many more interesting sites. If you want to get the sneak peak of the city then you can continue with a tramway tour through the city’s narrow streets and alleyways. Return back to the hotel for dinner and overnight stay. After breakfast check out from the hotel and proceed towards railway station to board a train to St. Moritz. Upon arrival, check into the pre-booked hotel and enjoy rest of the day at leisure activities. St. Moritz is more than just a holiday resort. It is the birth place of Alpine Winter Tourism and is a major attraction for tourists from all around the world. Snow- covered mountain peaks, emerald forests, shimmering lakes; best resorts in the world make it a hot spot in the world. Post breakfast get ready for one of the most unforgettable experiences of your life towards a journey on Bernina Express which offers you the most spectacular ways to cross through the Alps, pass through glaciers, varied trains of orchards, chestnut trees and vineyards on its way. The train passes through 55 tunnels crosses 196 bridges, passes through Chur, Davos, St. Moritz, Tirano that links up various regions, cultures and languages. At the highest point on the height of 2,253 meters above the sea level, you will find Ospizio Bernina which delight the visitors with magnetic natural surroundings and found the Alps amazingly beautiful. The railway line from Thusis –Valposchiavo- Tirano has got the UNESCO World Heritage status. Return back to the hotel for dinner and overnight stay. After relishing breakfast check-out from the hotel to board a train for the further journey to Zermatt, a mountain resort quite popular among adventure enthusiasts renowned for hiking, skiing and climbing opportunities. 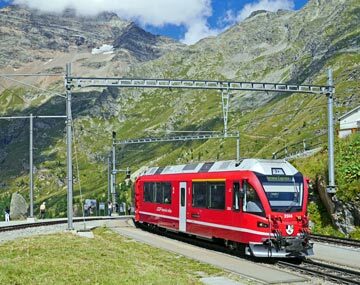 The Glacier Express to Zermatt takes you through 291 bridges, 91 tunnels and 2,045 meters- high Oberalp Pass. Upon arrival, walk to your pre-booked hotel and take some rest. It lies at the foot of the Matterhorn is a car free zone which has preserved its original character and offers unlimited possibilities for the excursion. Enjoy rest of the time at leisure with dinner and overnight stay at the hotel. In the morning post breakfast proceed towards Matterhorn Glacier situated at an airy 3883 meters of altitude is the highest aerial cableway and summit station. It offers the hypnotic views of mountains in Italy, France and Switzerland. The Ski area on the Theodul Glacier remains open for 365 days. Upon reaching Matterhorn Glacier mountaineers and hikers accompanied by a mountain guides set off to the Breithorn which is situated on the height of 4,164 meters. It is about 2.5- hour climb and on a clear sunny day, you can even enjoy the views of the stretch of Mediterranean Mont. Blanc in France or the summit of the Gran Paradiso, the highest peak of Italy. After enjoying such a rewarding experience return back to the hotel for dinner and overnight stay. After breakfast check out from the hotel to proceed towards railway station to board a train towards Interlaken. Upon arrival, check into the pre-booked hotel and take some rest and enjoy rest of the day in exploring the beautiful spots on your own. Interlaken lies in the Bernese Oberland on the alluvial plain between the lakes of Thun and the Lake Brienz. It is one of the most sought-after vacation destination presided by three beautiful mountains Eiger, Monch and Jungfrau. Return back to the hotel for dinner and overnight stay. Post breakfast get ready to proceed to enjoy a sightseeing tour of Interlaken which offers a fantastic base for seeing the best of Central Switzerland. Visitors can indulge in boat tours on Lake Thun and Brienz or can go for a thrilling funicular or train rides to spectacular peaks. Visit the Harder Alpine wildlife park, Museum of Tourism, Interlaken Monastery and Castle, explore the greatest mysteries at Jungfrau Park etc. Return back to the hotel for dinner and overnight stay. On the last day of Switzerland Honeymoon Package check out from the hotel and proceed towards railway station to board a train to Zurich airport to board a flight for the return journey. Switzerland is located in the central Europe and is one of the pristinely beautiful countries in the world. Nicknamed as the King of Alps its snow covered mountains, world’s best chocolates, bold architecture, amazing shopping avenues, great outdoor activities etc make it one of the hot spot destinations for adventure lovers to honeymooners to enjoy best holidays of your life. If you are planning for Switzerland Tour Package then look no further. Our great experience, huge discounts, best deal in flight bookings, hotel bookings, car rentals etc make BookOtrip one of the most reliable tourist planners that provide you amazing holiday experience no matter wherever you go.